Personal goal setting is a thinking process about specific things you want to accomplish in your lifetime. To easily manage the process you may want to pick several goal categories. These lifetime goal categories will give you the perspective that shapes all important decisions that you’ll be making in your life. There are some specific areas of your life that need special attention and accomplishment. 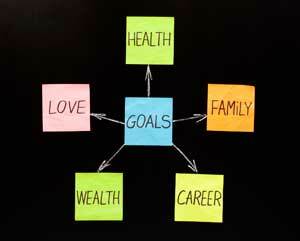 The following categories will help you to focus on certain aspects of your lifetime goals. In setting personal goals you can make a list of goal categories: mental, family, financial, career, physical, and pleasure. Except the career area you can add, reduce or even change the name of the areas of the list. Mental: Do you have negative thoughts or mindsets that hold you back? Take a look at your behavior in certain situations and ask yourself if this was something that prevented you from reaching a specific goal. Family: Setting family goals are a bit more difficult than other goals because your decision will affect someone else as well. You’ll first need to decide if you want to be a parent and if you want the responsibilities that come with parenting. Financial: Determine how much you want to be making when you reach a certain age. Career: Depending on what career you want, there will be goals that you need to set to make sure that you have all your credentials at the end of your schooling. Ask yourself what level it is that you want to reach in your career. Physical: Determine if there are any athletic goals that you want to reach. This is as simple as staying in good health or as complicated as learning how to mountain climb. What will it take for you to reach this physical goal? Pleasure: Make a list of things that make you happy. Then make another list of steps that you can take to incorporate more of these pleasures into your life. Once you have a list of the above categories clearly written, assign them with a priority number. Start with the number one priority and then start to carry out changes in your life until you can achieve this goal. You can work down the list but be flexible with the priority. Your lifetime goals are the milestones that you want to reach for your own personal achievement. When it comes to lifetime goal setting, it’s important that your decisions for yourself are going to fit into the person you want to be. In this case you may need to be firm in the goal categories that you feel are most important to you. Continue reading successful goal setting here.